DES MOINES – With just over one week remaining until the start of training camp, Iowa Barnstormers Head Coach and Director of Football Operations Mike Hohensee has been busy finalizing the team’s pre-season roster. 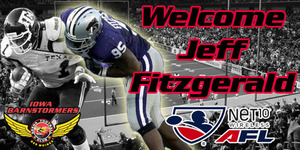 Wednesday evening Hohensee announced that veteran LB/DL Jeffrey Fitzgerald has been assigned to Iowa for the 2013 season. With this latest addition, the Barnstormers have now been assigned 31 players for the upcoming season. Fitzgerald (6-4, 270) is a two year veteran of the Arena Football League having spent time with Philadelphia (2011) and Chicago (2012). In two seasons, he compiled 59 tackles, 4.5 sacks, 3 forced fumbles and two fumble recoveries. Prior to that, Fitzgerald attended the Kansas City Chiefs 2010 training camp. He played college football at the University of Virginia from (2005-07) before transferring to Kansas State for his Senior season (2009). His four year totals included 177 tackles, 19 sacks, 5 interceptions and 6 forced fumbles. He is a very versatile player who can play both LB and DE. Fitzgerald is a native of Richmond, VA where he was a star at Hermitage High School in football, basketball, baseball and track. The Iowa Barnstormers report for training camp on March 1, 2013. Don’t forget that season tickets for the 2013 Iowa Barnstormers season remain on sale now for as little as $99.00 per seat. Don’t miss a minute of the action this season! 5-game Pigskin Packages are also on sale. To order your seats today, or for more information, call the Barnstormers at (515) 633-2255 or log onto www.theiowabarnstormers.com.